Law enforcement agencies often say to potential applicants that working for us is like joining a family. Well for the Velazquez family they have taken this to heart. 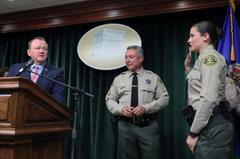 On January 29th Sheriff McDonnell swore in Alexis Velazquez at the downtown Los Angeles famed Hall of Justice. This made her the twelfth of the Velazquez family to work for the Los Angeles County Sheriff’s Department. 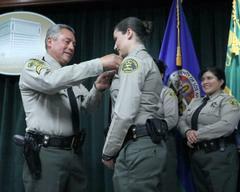 Alexis, who was already a POST-certified law enforcement officer, laterally transferred to LASD from Ventura County Sheriff’s Department. and connected several of the siblings in marriage to other LASD members. The generation of siblings in law enforcement, in turn, inspired a second generation of do-gooders: In 2014, Enrique’s daughter, Alexis, became a Ventura County deputy sheriff, in 2016, his son became a Los Angeles County deputy sheriff, and in 2014, his niece, Laura Marie Velazquez, became a Law Enforcement Technician with LASD. The Velazquez clan are the largest known number of direct family members within our agency to work together, not only as real-life family members, but as part of a larger, law enforcement family. During the formal badge pinning ceremony it was noted that Alexis’s badge was formerly owned by her father. Astoundingly, the Velazquez family represented a total of 256 years of proud service spanning different jails, patrol stations, detective bureaus, and specialized units of assignment.